As a live band, A Thousand Horses is second to none with their energy and love for music. The band, which includes Michael Hobby (Lead Vocals), Bill Satcher (Lead Guitar), Zach Brown (Guitar and Vocal) and Graham Deloach (Bass and Vocal), prides themselves on being influenced by some legendary bands, such as The Black Crowes, Lynyrd Skynyrd, Tom Petty and the Heartbreakers and The Allman Brothers. And let me tell you something, you can certainly hear those influences from beginning to end on their new album. I’ve had the album for three days now, and it has been playing on repeat ever since. First and foremost, the music is fantastic and something that is desperately needed in today’s country music scene that has become oversaturated with the same songs, same artists and “bro country” taking over the airwaves. “Tennessee Whiskey” showcases the band’s Southern roots as it shows emotional heartbreak in the form of a conversation with none other than the iconic drink. Yep. It plays just like it sounds. “Trailer Trashed” brings out the redneck side of the band and “(This Ain’t No) Drunk Dial”, the band’s second single which is just hitting the airwaves, tells the story of singer Michael Hobby looking for a second chance in a relationship gone wrong. Now THAT sounds like a country song, right? I’ve reached the 6th paragraph, and I’ve yet to mention “Smoke”, the #1 hit on country radio which has made A Thousand Horses a household name. I originally wrote a review of this single back in January, and have been thrilled to watch it climb the charts over the months since it’s debut. You may have caught it on National TV recently as well as a short snippet on the CMT Awards. Great vocals. Great rhythm. It’s certainly catchy and, like I said earlier this year, it’s the type of song that country radio needs right now! I’ve heard others say that A Thousand Horses is too close to a knockoff of the bands I mentioned above. But I’m here to tell you that they are far from it. This is a band that goes out and does their own thing every night. Like everyone else, they take cues from their influencers, but A Thousand Horses is a band that you need to see live to fully understand why they should be considered one of the artists to watch over the next few years. The band is currently on tour with Darius Rucker and Brett Eldredge and trust me, this is a band that won’t be an opening act for long so make sure that you arrive early if you are catching the show! Don’t say I didn’t warn you. In my opinion, “Southernality” is in the running for Country Album of the Year in 2015. This is an album that you can listen to from beginning to end without having to skip a song. 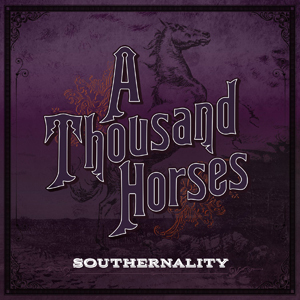 Playing a mixture of southern rock and well-written ballads, A Thousand Horses is what country music needs in 2015. *My only wish is that they would have included live tracks of The Black Crowes “Hard to Handle” and Tom Petty’s “I Won’t Back Down”. Two great cover tunes that the band tends to play live. Maybe on the next album! So if you’re looking for a great album this summer, make sure you pick up “Southernality”. You can find it at stores like Best Buy, Target and Walmart and it is available for download on iTunes and Amazon.